Even though we have over 60 Short Courses throughout the year catering to all abilities and interests, sometimes it just doesnt work out that there is a cookery course when you are coming to visit. In this case it is often possible (based on availability) to book a private class with one of our tutors. 2.15pm Guided Tour of Organice Farm and Gardens, including a visit to our Dairy, our food gardens and our glasshouses. 3.30pm Back to Cookery School and into the kitchen to cook up a delicious 3 course meal with one of our tutors. We have a selection of delicious menus to choose from. 6.00pm Finish up, and sit down to a delicious early supper that you have cooked with a welcome glass of wine. This is an example and can be modified for each individual event. A discussion can be had around menus so you can make that recipe you have always had trouble with. Every event includes an apron and a copy of all the recipes done in the afternoon. The cost is €640 for the group. The Cost for a larger group is €280 per person. For 10 people and above, up to maximum 40 people. For larger groups we have slightly differnt itinerary which includes a short demonstration showing how the dishes are prepared. 2.15pm Guided Tour of Organic Farm and Gardens, including a visit to our Dairy, our food gardens and our glasshouses. 3.00 pm Back to Cookery School to watch a short demonstration of all the dishes from one of our senior tutors. 4.00pm Into the kitchen to cook up a delicious 3 course meal with one of our tutors. We have a selection of delicious menus to choose from. The cost is €2400 for a group up to 18 then €120 per person above that. For groups up to 80 - 100 people it is sometimes possible to organise a demonstration class where everyone gets the recipes, enjoys the demonstration (2 hours) and then gets a tasting plate at the end. 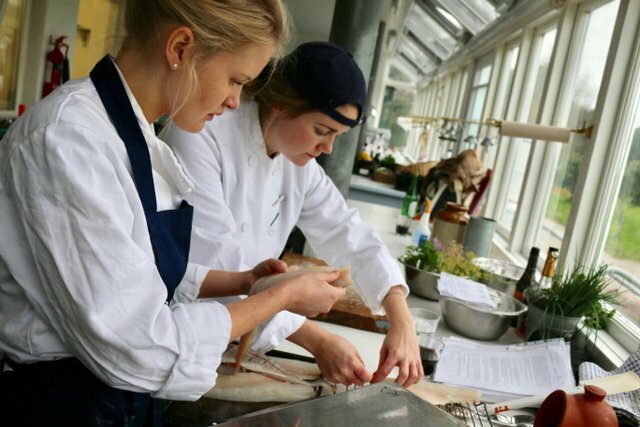 Unfortunately as a general rule it is not possible for us to take bespoke classes in the mornings, as our main student body is cooking in the kitchens each morning. If you would like to book, please contact the school directly either by email toby@cookingisfun.ie or by phone +353 21 4646785 and we can discuss your requirements. Dates can be quite restricted depending on what else is on at the cookery school at the time, so if possible try to discuss dates with us as early as possible.